New Delhi: The Sir Ganga Ram Trust Society, Board of Management, Consultants and Staff of Sir Ganga Ram Hospital (SGRH) celebrated its Founder’s Day on 13th April ‘2018. On this occasion Shri Rajnath Singh, Hon’ble Union Minister of Home Affairs, Government of India was the Chief Guest. The celebrations started today morning by garlanding the statue of Sir Ganga Ram. Later in the day, Union Home Minister, Shri Rajnath Singh inaugurated Eleven floor Multi-Level Car Parking, which can accommodate over 800 vehicles. The parking block is a pre-requisite for further construction & expansion of the hospital complex. 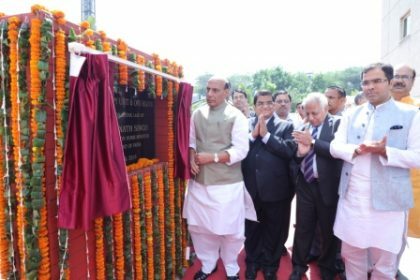 Shri Rajnath Singh also laid foundation stone of Radiotherapy & OPD Block. Speaking on the occasion, Shri Ashok Chandra, Chairman, Sir Ganga Ram Trust society said “ For good doctors at tertiary care hospital , apart from state of art infrastructure for delivery of health care , academics and research are also very important components . SGRH is well known in non-government sector for having excellence both in academics as well as research . I am proud to say that our hospital apart from producing talented faculty for its own use , is also a nursery for providing talented doctors for delivering health care services across the country. Sir Ganga Ram was an engineer by profession who was born on 13th April 1851 at a village Mangtanwala of Punjab Province in British India, in present-day Pakistan. He graduated from Thompson College of Civil Engineering in 1873. In 1921, he established Sir Ganga Ram Hospital in Lahore which still functions by the same name and is a 500-bedded hospital attached to Fatima Jinnah Medical College. He expired on 10th of July 1927 in London. Sir Ganga Ram Hospital in Delhi was inaugurated in 1954 by then Prime Minister of India, Pandit Jawahar Lal Nehru and is today 800-bedded multi-speciality, tertiary care hospital. Essentially an elite hospital meant exclusively for the VVIP-elitists.